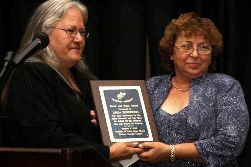 Virginia State Council of Machinists Secretary-Treasurer and Local 2531 member Linda Henderson received the 2009 “Woman of the Year” award from the Western Virginia chapter of the Coalition of Labor Union Women (CLUW). The award was presented by WV Chapter President Tina Campbell at the “Bread and Roses” Labor Awards Dinner in Roanoke, VA. It recognizes Ms Henderson’s tireless advocacy on behalf of the labor movement and working women and men in West Virginia. Virginia Local 2531 member Linda Henderson (right) receives the 2009 “Woman of the Year” award from CLUW (Western Virginia Chapter) President Tina Campbell at the CLUW Labor Awards Dinner.